There's a huge number of toy libraries and toy museums throughout the UK, many of which have a charitable status. In addition to this however, there are also a small number of larger charitable organisations that have been set up to make a positive difference to the lives of children and their families through the use of toys and play. Rather than focussing on just the donation of toys, these charities often work to provide advice, support and training to disadvantaged children and familes through the UK. 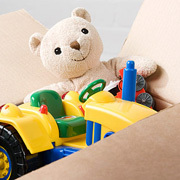 If you know of a toy charity that should be listed in our directory, please let us know. Founded in 1990 by the British Toy & Hobby Association, The Toy Trust has donated nearly £3 million to disadvantaged children and their families since it's formation.